Little Darius Bean is full of energy. At 2 years old he doesn’t walk from place to place, he runs. On Tuesday, he and his father joined Windham parks and rec employee Lynn Bucknell at Donnabeth Lippman Park to walk (or run) the new story walk, titled “Bug Safari” written and illustrated by Bob Barner and published by Holiday House. The story walk opened to the public this week, featuring the book spread out page by page into 14 signs that meander through a trail at the park. In June the idea to do the story walk became more than an idea and Ross applied for a grant and was given around $300 from The Opportunity Alliance in Portland to fund the project. If the parks and recreation department can get the funding they would like to have a few more stories to “mix it up” through the year, Ross said. 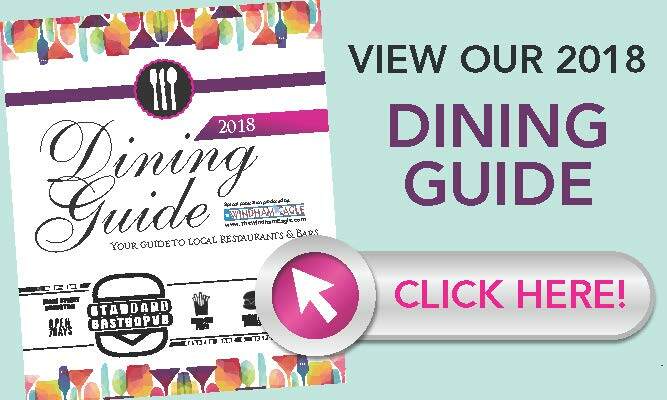 The Windham Public Library supported the project and they have the hardcover book in circulation for those who would like to read it at home or at the library. Ross also worked with Kirsten Cappy at Curious City in Portland, an advocate for children’s literature. The visitors to the story walk are encouraged to hop like a frog or march like ants from sign to sign. “I thought it was a good fit for our area – it’s a nature type book,” said Ross. Ross encourages families, daycares and anyone interested to visit the story walk right of Route 302 in North Windham. One group brought a picnic lunch to have after they took the story walk. Enjoy the good weather with a book. The signs will be in place until mid-November or until the snow flies, said Ross. Classes involved in Manchester Gardens for Learning have been working hard this month to gather the bounty grown in their school gardens. This year’s harvest includes tomatoes, cucumbers, peppers, carrots, melons and some good sized pumpkins, as well as garlic, herbs and a variety of greens. 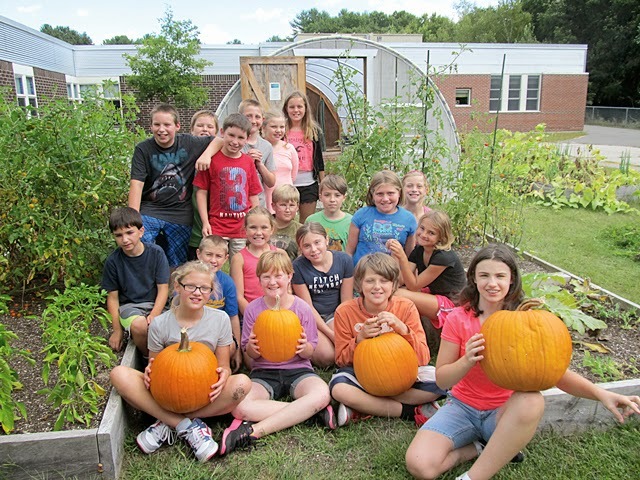 The produce is used in the school cafeteria, and any surplus is given to the local food pantry, according to master gardener Pam Lanz, the school’s retired guidance counselor who remains very active as a volunteer with the gardening program. Sabrina Nickerson, one of the teachers involved in the program, said that students help harvest the vegetables, as well as assist with putting the beds to sleep for the winter, planning winter crops for the hoop-house, and in February, choosing and starting seeds for the 2015 gardens. Gardening has been an element at Manchester School since the school’s renovation in 1998/99, according to Lanz. At that time, she was asked to plant some flowers and bulbs to add to the landscaping. In 2009 the Manchester Gardens for Learning committee was formed, and they decided to try planting some vegetables. 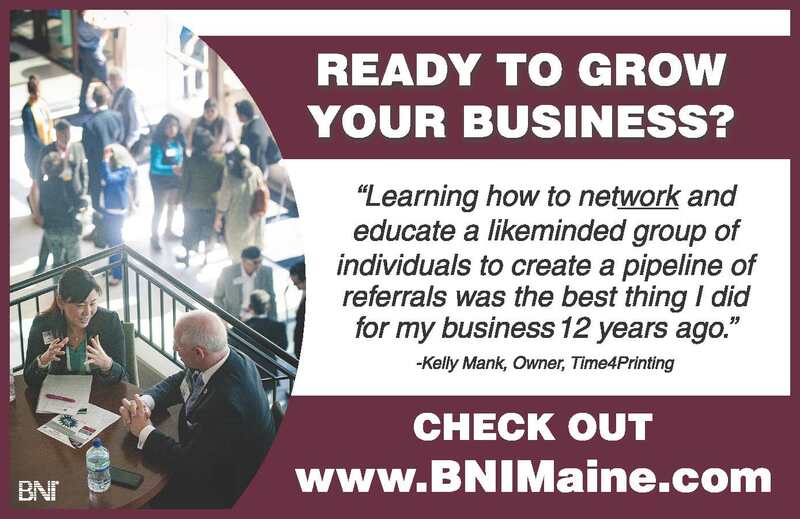 Inspired by a school in Gorham, said Lanz, the group started small. Three classroom teachers were interested in participating, so three raised beds were built. In 2011, the group received a grant to build a hoop house to extend the growing season, providing more food for more of the school year. The hoop house at Manchester was the first commercial hoop house built by David Tidwell at Eden House, and he has been a source of ongoing support, said Lanz. For the past two years, greens grown in the hoop house have survived bitter Maine winter weather and been served in the cafeteria. The goals of the gardening program were originally tied into addressing the obesity epidemic, Lanz said. The group wanted the children to understand where food comes from, and what makes food healthy. The main goal was to grow food so it could be used in the school cafeteria. The adults try to direct students towards that goal when choosing seeds to plant. “We’re getting better at what we grow, and how much we grow,” said Lanz. This year the group has been tracking how many pounds are harvested, giving those numbers to food service so they can see how much money they are saving by using school grown produce. An added bonus, said Lanz, is that children are also gaining hands on learning in many subjects, which research has shown leads to better academic achievement. “You can incorporate most school subjects into gardening, particularly math and science,” said Lanz. The Manchester Gardens for Learning program has support from a core group of staff and parents who help maintain the gardens. Lanz added that Bill Hansen, Director of Facilities for RSU 14, has also been supportive in many ways, such as setting up grow lights and allowing for the added electricity costs. “That’s really critical if you’re going to have a structure like that on school property,” said Lanz. In addition to the hands-on gardening tasks, students have lessons in the classroom, learning about topics like pollination, seed starting, sprouting and sampling sprouts. Lanz said they try to do these lessons during the colder months, when it’s harder to get outside. Working in the garden often allows unexpected real life lessons, such as when the students found a hornworm and a rich discussion arose, said Lanz. “It’s exploring, for many of them, something they are not that familiar with,” she said. Future goals include starting a compost pile and fencing the garden to ward off potential pest or theft issues. The school has been fortunate to date, not having had to deal with any major issues in the garden, said Lanz. “We’re trying to grow things more so they are ready when the kids are there,” Lanz added. Manchester Gardens for Learning will hold a community open house as part of School Garden Open House Day on Saturday, September 27th, from 10 a.m. to 12 p.m. They will offer a variety of activities and tours of the garden. As part of Shaw’s Supermarkets’ 150 year commitment to community service, the company has launched the “We Love Our Schools” program. According to Greg Duball, the store manager in North Windham, “The staff and I looked at the communities that our store serves and selected one school in Gray and one in Windham to offer a partnership to.” He explained that the program offers various types of assistance to the schools ranging from volunteers for special or ongoing assignments to funds for special projects, initiatives and events. 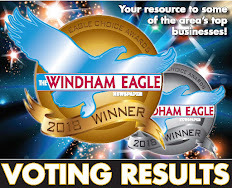 Russell Elementary in Gray and the Windham Primary School were the recipients of the program with Duball noting that it was a conscious decision to select elementary schools because staff saw more opportunity for volunteer activities. 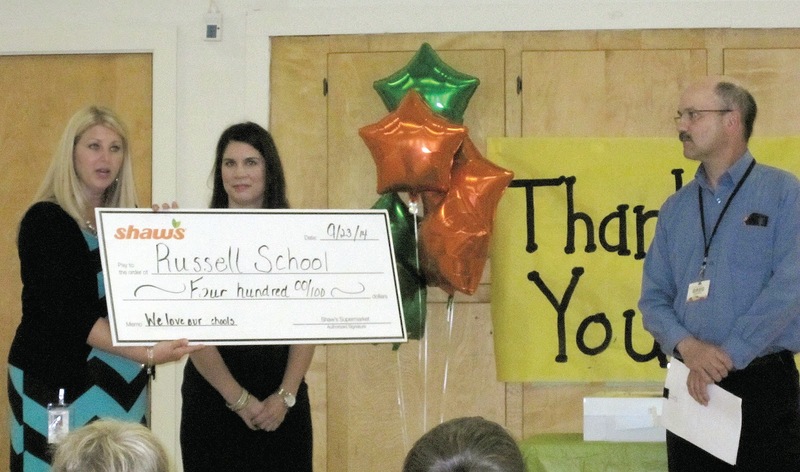 To kick off the We Love Our Schools partnership, Duball and two store employees, Bakery Manager, Denise Biossonneault, and Assistant Deli Manage, Chelsea Spurling visited Russell on September 23 with two beautiful sheet cakes and a check for $400. About 30 children representing kindergarten, first, and second grade, along with parents, teachers and staff gathered to greet and thank Shaw’s for the gifts. Russell School Principal Gloria Noyes said that staff and the students would put their heads together to find a good use for the money. She noted that there is much interest in STEM as well as health initiatives and in the schools’ “I Care” program. As for the cake? Students and staff were planning to dig in during lunch on Wednesday. 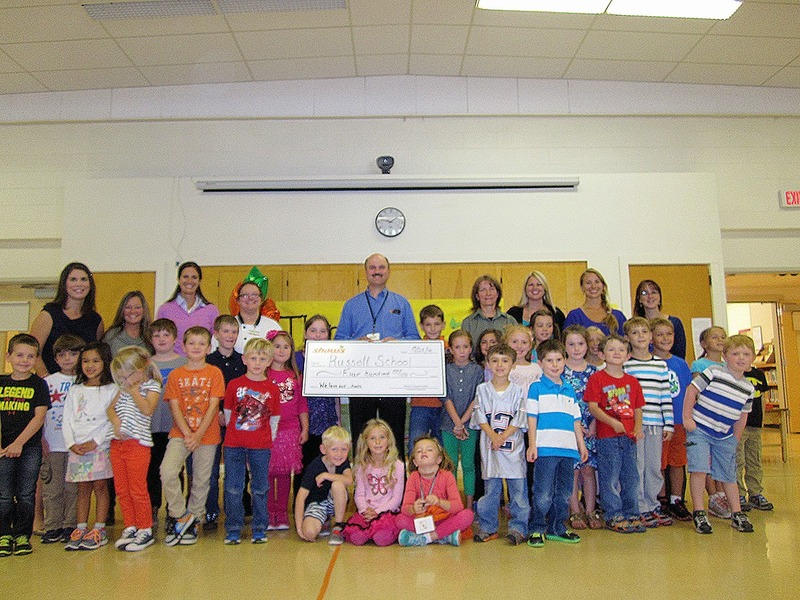 Duball and his staff were headed to the Windham Primary School for a similar presentation on September 25. This Sunday, bikers can take a scenic ride around the Sebago region to raise awareness and hopefully money for Idiopathic Pulmonary Fibrosis (IPF) research. Each year 40,000 people die from Pulmonary Fibrosis and Betty Jo Cash wants to find a way to stop this disease that directly affected her family when her father was diagnosed in 2013. “I don’t want other families to go through what my family is going through,” Betty Jo said. Betty Jo was approached by a woman who had organized a ride for IPF. She asked Cash to hold one in honor of Cash’s father, David Watts. Watts, a 68-year-old Windham resident, was okay with having the ride, but he wanted the money to go to research for a cure for the disease that was stealing his breath. September is pulmonary awareness month, so the perfect time to hold a fundraising ride. IPF is a “relentless scarring process of the lung that leaves the patient unable to breathe. PF remains untreatable and terminal.” By not breathing, the oxygen is not moved around the body, delivering needed nutrients to the heart, brain and other vital organs. Watts worked at the Brunswick Naval Air Station for 32 years, 20 of those using heavy equipment. He was also a plow driver for the Town of Windham. Now he is a part time worker with the Salvation Army. He likes to be busy and has a good sense of humor. The Ride IPF starts at 9 a.m. at the Windham Veteran’s Center. Watts will ride in a car, but as a motorcycle enthusiast, he will be happy to hear the rumble from his seat. He misses riding and going to planet fitness to work out. He still drives and is encouraged to keep working as part of his treatment. Sunday, September 21, it will be kickstands up at 11 a.m. There will be speakers between 10:30 a.m. and 11 a.m. and on the return there will be a barbeque lunch, music by deBreeze N’ Keys, a live auction and T-shirts for sale. The ride is free, but donations are greatly appreciated, Cash said. Bikers are known for riding for causes. Be it Toys for Tots or against childhood bullying, bikers do so much for so many,” said Cash’s husband, Norm. “When they’re out there rattling your windows, it’s for a reason,” Watts said. The initial goal was to have 50 bikes signed up, but now on Facebook there are over 173 signed up. “I asked my doctor if there was anything in the pipeline for this disease. She said the Chinese have a good start on something. It wouldn’t be in time for me,” Watts said. For more on the ride visit www.rideIPF.com or visit them on Facebook – Riding for Pulmonary Fibrosis. For more on IPF, visit www.CoalitionforPF.org. Not a motorcyclist? Donations can be made directly through either website. 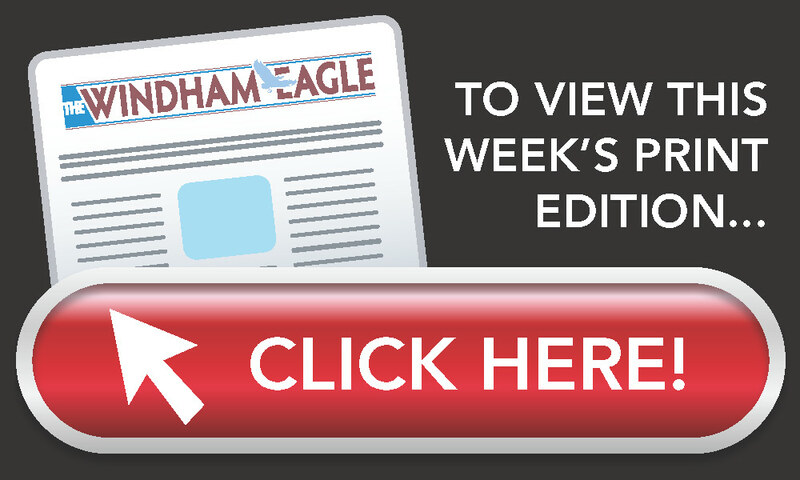 The 21st Annual Windham Car Show saw over 300 cars from antique autos build before 1949 to muscle cars and everything in between last Sunday behind the Windham Mall. Hundreds of people stopped by to catch a look at the cars from their youth and to salivate over restored beauties. “It’s nice to see the fantastic appreciation for all the cars we grew up with. It’s nice to see a true survivor just like us,” said Dean Martin of Westbrook, who likes the big block Chevys. Dan Burnell from Portland likes Chevys as well, but he really likes the old classic cars, he said. Car shows allow people to check out their favorite cars all in one place. “I have actually seen a few cars I’ve never seen before,” said Mark Herring. Frank Jimino, a local mechanic, has been coordinating judges for the event since his children were in school, now his grandchildren are in school. “There’s nice stuff, like always,” he said. “Hopefully the boosters made money.” Jimino also said he likes to watch the crowds and their reactions to the cars. This year he had 20 judges to judge four classes and an overall winner. Bill Webber from Gorham won the Best in Show prize with his 1966 Shelby GT 350 Mustang. Arthur and Debbie Vaughan brought their Jeep to the event, but Debbie said she likes the ’55 and ’56 Chevys. “I’d go for a Camaro any day,” Arthur admitted. Robert Sanborn from Scarborough has been doing car shows and restoring his truck for 10 years. The first time he attended a show he said he was a Plain Jane. After adding ghost flames and lowering the body 2 and a half inches. “There’s not much I haven’t done to it,” Sanborn said. Sanborn likes the smaller shows because they are a lot of fun and the people are nice. It’s always nice to get a trophy, but mostly it’s about the organization the money benefits. The Windham-Raymond Athletic Boosters raised approximately $8,800 for items not budgeted for in the athletic budget at RSU14.